Take a guided tour of another world Saturday when Paul Ferro of the Oregon Natural Desert Association (ONDA) will lead a free walk through the Badlands, a proposed wilderness area, just 15 miles east of Bend. Ferro will lead hikers over sandy trails and through rocky canyons while discussing the features, flora and fauna that defy any negative connotations stemming from the name. 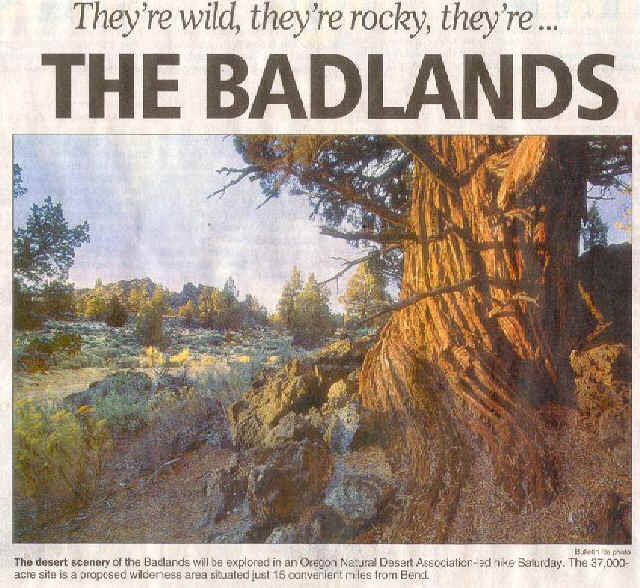 Actually, the Badlands, all 37,000 acres of it, is not technically a badlands, notes author Andy Kerr in "Oregon Desert Guide: 70 Hikes." "The dictionary defines badlands as 'barren land characterized by roughly eroded ridges, peaks, and mesas.' Oregon's badlands are a little different. There are not many peaks and the edges are rough, not from erosion, but the lack thereof. Geologically, the flows are relatively new, and erosion has been slight." The Badlands popularity as a recreation area, however, is not slight." The area is used by off-road motorcyclists, mountain bikers, hikers and horseback riders. An area must be "in primarily natural condition" to be considered far wilderness status, says ONDA'S Laurel Hickok, assistant Wildlands Coordinator, who adds that the Bureau of Land Management found that the Badlands did pass muster in a recent study. Further, she adds, a place must provide outstanding opportunities for solitude and recreation, to be declared a wilderness area. Ferro plans three stops. First, he will lead hikers to the pit crater near milepost 15. He will then lead them through Dry River Canyon, where ancient Indian pictographs recently sullied by vandals and salvaged by volunteers can be seen on the walls lining a long-dry river channel. The final stop will be at "big" Dry River Canyon, at the scenic overlook off Highway 20. Participants will depart from the parking lot of Pilot Butte 6 carpooling or taking their own cars. They can also leave at any point in the tour, which is expected to last until 2 p.m. It lakes a slightly different sensibility and more discerning eye to appreciate High Desert beauty such as that found in the Badlands. They're definitely pretty remote and isolated," says Hickok. "When you take a first look at it, it tends to look like a desolate expanse of sagebrush. But it definitely has a lot more to offer." Hickok notes that when a lot of people think of wilderness, they picture places like Three Sisters Wilderness, with glaciated mountains and forests thick with trees. However, with the increase in popularity of Eastern Oregon landscapes like Steens Mountain, "people are staring to appreciate the unique, High Desert ecosystems more than they use to," she says. Note: We understand that almost 200 people showed up to take the tour. Two additional leaders were recruited and rain checks were given to many! Watch our Calendar for future ONDA tours of The Badlands. Vandals destroy, deface Badlands Pictographs!